Sucker rod is the rod beam for pumping well, it’s top head connect the polished rod bar, under the sucker rods connect the pump, to transfer the power for pumping. We have API 11B sucker rod for sale in below grade and dimensions. Standard and Grades API 11B Grade C, K, D, KD, HL, HY. Outer Diameters:5/8 in, 3/4 in , 7/8 in, 1 in, 1 1/8 in, 1 1/4 in, 1 1/2 in, 1 3/4”. Pony Rods Length: 2 ft, 4 ft, 6 ft, 8 ft, 10 ft and customized. Material types in AISI 4130M, AISI 4138M, AISI 4330M, AISI 4142M, AISI 8630, with high strength and anti-torsion performances. Ends Type: Class T coupling, Reduced Diameter, SM coupling. API 11B specification includes the technical requirements for Sucker Rod, Pony Rod, Drive Rod, Polished Rod, Sinker Bar. 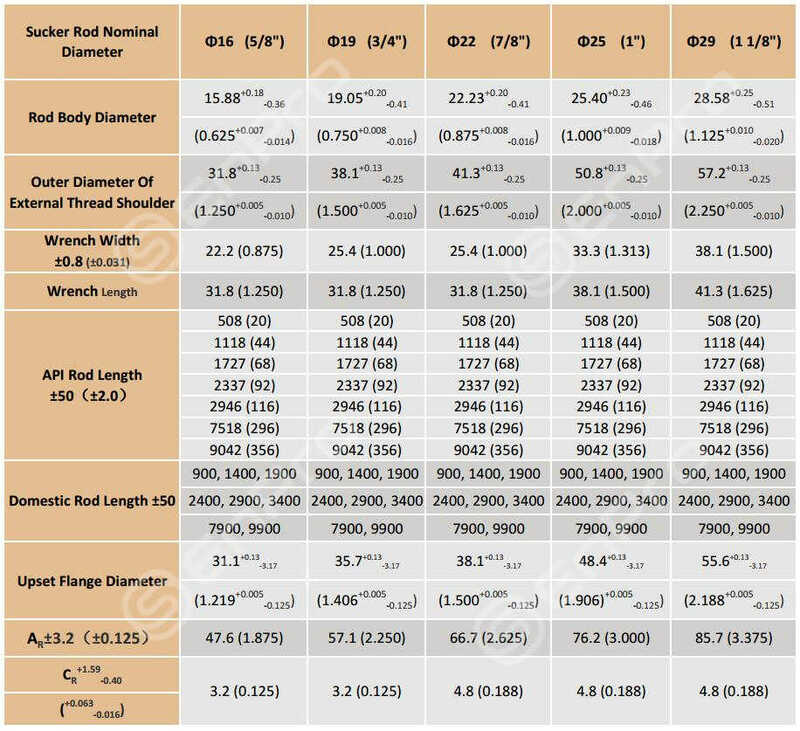 Sucker Rods Grade C, D, K steel materials including ANSI 41XX (4138M, 4330M, 4142M etc) chemical composition as below. Please note above values are for references, in case specific order, manufacturer maintain the reservation to modify it. a. Grade C sucker rod minimum and maximum tensile strengths of 90,000 and 115,000 psi, respectively. b. Grade K: 90,000 psi to 115,000 psi. These rods are made with 1.65 to 2.00% nickel alloy, therefore, it is more expensive than Grade C but has improved corrosion-related properties. c. API 11B Grade D sucker rod tensile strength minimum 115,000 psi and maximum 140,000 psi. Grade D covers three types of material: Carbon steel, alloy steel, and special-alloy steel. d. Material general made of high quality carbon steel, to reach the mechanical properties to above table. e. Molybdenum steel (but not limited to this type of steel) is generally used, the mechanical strength shall be achieved through proper heat treatment. 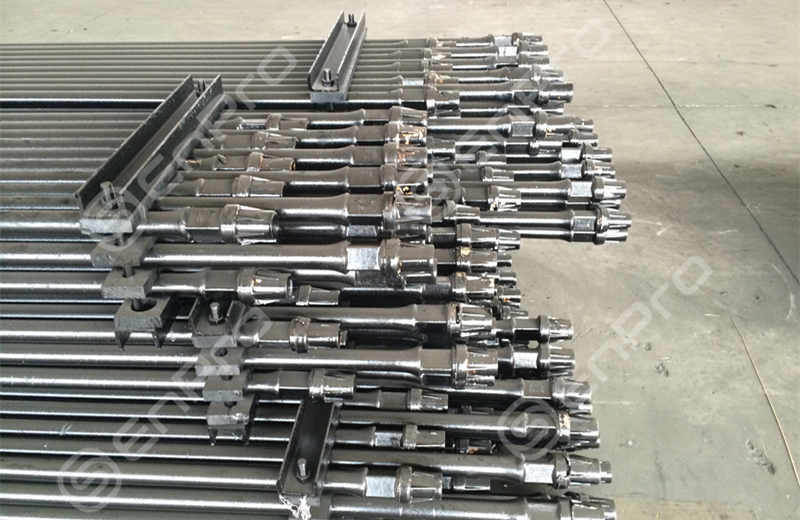 As we know in API 11B there are Grade C, K, D, more over there are high strength sucker rods with Standard SY/T5029-2006 covers grades in KD, HL, HY; KH level rod will be complied with manufacturer internal protocols. 1. Grade C sucker rod is mainly used for light, medium load, no corrosion or corrosion shallow Wells or in deep well pumping, material is carbon steel or manganese steel. 2. Grade D sucker rod is made of high quality alloy steel, after heat treatment with high strength, plasticity is good, long life and other characteristics, it is suitable for light when there is no corrosion or corrosive medium in the deep Wells under the environment of use. 3. Grade H(HL and HY) sucker rod is made of high quality alloy steel manufacturing, have the characteristics of ultra high strength, used in deep well, big strong pump used in production. 4. K and KD sucker rod with different content of Ni Cr – Ni – Mo high quality alloy steel manufacturing, have anti-corrosive, resistance to corrosion function, respectively applicable to strong corrosion of shallow, middle and deep Wells. The rod connector is welded with the rod body through friction welding followed by heat treatment and rolling depression. The sucker rods have the advantage of stable mechanical property and improved fatigue strength. It’s thread is manufactured with a compression and rolling machine, to get a continuous metal fiber thread. This technique improves thread strength and decreases stress concentration. The center diameter of the thread is controlled strictly, which makes the load to be evenly taken by the thread teeth thus increasing load capacity and preventing loosening of the connection. Grade in C, D, K, KD, HL, HY. Material in AISI 4138, 4142, 4330, 4621, etc.